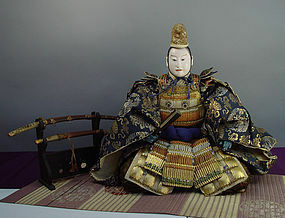 Japanese samurai dolls are part of the display used for Boy’s Day on every 5th of May in Japan. The dolls are figures of historical heroes or legendary people to inspire the boys of the family (probably husbands are also included today) with their manliness and hopefully discipline and bravery to go along with them. Samurai’s Yoroi armor, Kabuto helmet with swords, bow with arrows are popular items chosen today for the day. This is a large, very impressive musha ningyo (warrior doll). The quality of this doll is exquisite. It is the work of top doll makers. When the original hair (human hair) was gone, the black color was added on some areas of the head (unfortunate but it is commonly done). We spent hours cleaning the paint off his ears and the paint was so stubborn in one area (on his right year) that we needed to use sand paper. It had to be sanded down to a solid hard white coating. We learned the strength of the coating (probably many layers) when it is done right. The head was solid. The dimensions of this doll are 13 1/2" tall and 17" wide (sleeve to sleeve).